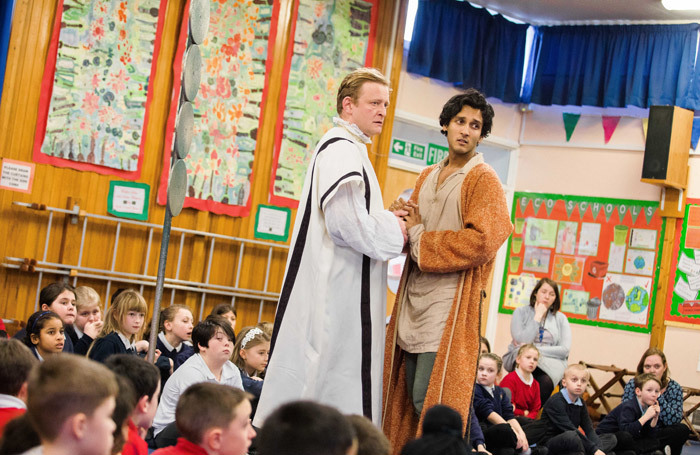 Julius Caesar isn’t the most obvious choice for an audience of children aged seven to 13, but director Marieke Audsley’s new production, for the Royal Shakespeare Company’s First Encounters with Shakespeare series, makes it a vivid experience. Audsley’s edit positively zips along – clocking in at just 90 minutes, including a lengthy introduction in which the kids are transformed into the citizens of Rome (they embrace the role of angry mob with particular relish), there’s no time to lose. Natasha Harrison’s full-throttle fight scenes are a big hit, but the dialogue keeps the young audience engaged too. Alisha Williams as Mark Antony and Tom Lorcan as Brutus, in particular, give wonderfully human and accessible performances. That said, I suspect that children attending public performances, who come to the play fresh, will have more trouble following the action than schools’ audiences who have been studying it ahead of the RSC’s visit. Max Dorey’s Elizabethan-flavoured costumes do a good job of differentiating between characters – helpful given the amount of doubling – and while his set is relatively simple, a pleasingly theatrical moment gives it a chance to shine. For a lot of the children that the RSC is visiting as part of this tour, this will be their first exposure to Shakespeare in performance. If their subsequent experiences of his work are half as enjoyable, they’ve got a wonderful theatrical journey ahead of them.